Sports fans love to place bets and make predictions on one of the broadest, most cliché lines of all-time: “Defense wins championships.” In reality each sport’s winning formula shifts through time. The rules are constantly changing. Teams are forced to scheme around different personnel. So while “defense” has proven to be more valuable than “offense” over the past century of professional sports, isn’t it worth taking a look at what types of defenses work now? Teams capable of playing successful two-way small ball dominate the NBA. As a result, the value of the New Age Shane Battiers has skyrocketed. There are many reasons for this shift in style, one of them being the lack of efficient two-way big men. You can’t win a Super Bowl in today’s NFL unless you can do two things well: sling the ball around the field in a two-minute drill and pressure the quarterback. Rule changes have made life hell for defensive backs. Quarterbacks are racking up more yardage than ever before, and the only way to stop them is to get them to the ground. 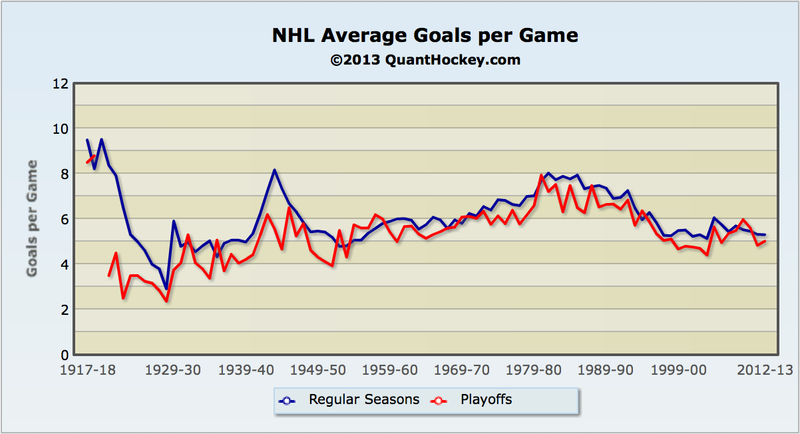 Goals have been hard to come by in the NHL. Goalies are growing bigger and getting better at cutting down angles. 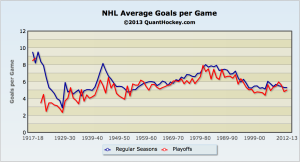 Hockey’s evolutionary move has been a trend toward puck-moving defensemen. If you have them, then you can break out into 3-on-2s and 2-on-1s. Your powerplay will be more successful. Take a look at the three Norris Trophy finalists this year: P.K. Subban (38 points), Ryan Suter (32 points) and Kris Letang (38 points). The Norris Trophy has become as much about offense as it is about defense. Lacrosse has become a very specialized sport. There are many more positions than goalie, defense, midfield and attack. Teams at all levels carry face-off specialists (FOGO), long-stick midfielders (LSM), defensive midfielders and even differences in the roles among attackmen. Once a team gains possession, all three midfielders come off the field for offensive midfielders. Suggesting that teams will stop this in favor of playing midfielders two-ways might seem ludicrous. However, this is exactly where I see the sport moving. Adaptation is imminent in Major League Lacrosse for three reasons: the eventual utilization of the two-point line, the imminent growth of the league and the continued efforts to increase the speed of the sport. The 2-point line is one of the big draws of the professional game, yet it is rarely used. Only one team (the Bayhawks) has enjoyed consistent success from beyond the arc. Take a look at the league averages in 2-pointers per game since 2006: 0.94, 0.54, 0.47, 0.69, 0.88, 0.72, 0.99 and 0.63. Never has there been a year in which the average team scores at least one 2-pointer per game – never! This is not because players cannot shoot the two-ball; it is more due to the rule still being young relative to the sport. Such resistance to change is expected; consider the NBA Finals. The three-point line has been in the NBA since 1979, but its prevalence saw its most dramatic increase in the last decade. In the 2004 NBA Finals the Detroit Pistons topped the Los Angeles Lakers, shooting 21-66 and 22-89 respectively from beyond the arc. The most recent NBA Finals saw nearly twice as many three-balls attempted and almost three times the amount made. The Miami Heat (64-148) outshot the San Antonio Spurs (61-150) on their way to the title. More important than the pure quantity of shots made and attempted are the percentages. Detroit (31.8%) and LA (24.7%) played a much different style than Miami (43.2%) and San Antonio (40.7%). Increased volume of three-point shooting is not a result of teams getting better over time. The 2004 versions of the Pistons and Lakers were no worse than the 2013 Heat and Spurs. Instead, these numbers are a reflection on the era. The “winning formula” in 2004 was not the same as in 2013. Teams do not necessarily evolve into better all-around teams; they adapt according to the strengths and weaknesses of their roster and their opponents. To the chagrin of old-time baseball fans, lacrosse is taking the country by storm – especially at the youth levels. There will be a time when every major city has a MLL team and pro lacrosse players are paid like other pro athletes. What will the repercussions of this be? When the league grows to the size of the NFL, NBA, MLB and NHL – about 30 teams – there will be a division of power. Today’s rosters would be considered “super teams.” You won’t find any attack units of Boyle-Poskay-Quinzani. A player of Jovan Miller’s caliber will not spend a season on the practice squad. Again, take a look at the NBA. In 1960 there were eight teams. The Boston Celtics had seven HOFers – Bill Russell, Bob Cousy, Tommy Heinsohn, Frank Ramsey, Sam Jones, K.C. Jones and Bill Sharman. Now the league is more profitable than ever, but you couldn’t name me three players on the Charlotte Bobcats. Any clear-headed GM will take the latter. Those offensive skills can be anything: decision-making in a fast-break setting, 2-point shooting or even just flat-out speed. As long as the midfielder brings value to the offensive side of the field, a team will sign him. Take a look at this fast break by the Cannons. Imagine if Jon Hayes had a dangerous 2-point shot – not a complete offensive skillset, just a shot. At the very least the Nationals would have to respect him. Instead, he is ignored. The Cannons are technically playing 5-on-4 until Sid Smith returns to the picture. However, since neither the Nationals defense nor Rabil views Hayes as a scoring threat, the Cannons have a brief 4-on-4. In today’s league teams can survive without fast-break offensive production from defensive midfielders. They generate enough offense in settled situations to make a great defender like Hayes worth dressing. Remember, teams of the future will not have Kyle Dixon, Ben Hunt, Michael Kimmel and Steven Brooks on the sideline waiting to sub. They’d be lucky to have one of those players. We live in a luxurious age where all offensive players have complete skillsets. The NBA transitioned from teams having seven HOFers to teams being led by Monta Ellis. Someday MLL teams will dress some players who have much more limited and specialized skillsets. Across all levels of lacrosse, sideline horns have been abandoned. Major League Lacrosse has a 60-second shot clock; many college teams take 60 seconds to clear the ball over midfield and change out midfielders. These factors are making the fastest sport on two feet even faster. Without a horn there is an increased opportunity for unsettled situations. If your team is playing defense and gains possession due to an errant pass, then the other team cannot call for a horn to get its defensive midfield unit on the field. It would be to your advantage to have two-way midfielders on defense so that you can capitalize in these situations. Just as a puck-moving defenseman creates a 2-on-1 or 3-on-2 from his own zone, a two-way midfielder can create a 4-on-3 or 5-on-4. A whole line of two-way midfielders could create even better advantages. The shot clock is important for a couple reasons. It limits a team’s ability to substitute and have a quality offensive possession. It prevents midfielders from having to play much more than a minute on defense at a time. If a futuristic, less-than-loaded opposing team can substitute, draw a switch, exploit your sub-par defensive player, and score in one minute, then I tip my cap to them. If they cannot, then you have an advantage in transition. And isn’t that worth the risk? Listed at 6’4’’, 245 lb., Porter is a physical freak. Despite being a dominant scorer in high school, he was asked to play defensive midfield at Rutgers. Like many others on the LXM Pro Tour, he has had the chance to showcase his overlooked offensive skills. Although it might be due to having small rosters, LXM is ahead of the curve at midfield. Fellow tour players Rhamel Bratton, Maxx Davis and Benson Erwin see time on both sides of the midfield line. There are positives (more transition looks, higher quality transition looks) and negatives (fatigued defensive midfielders, increased need for slides) to this for now; in the future, however, it might be a much more favorable option. A perennial unsung hero, Abbott took his offensive game to the next level this year. He doubled his career-high in points with an impressive line of 14 goals and 8 assists. His shooting percentage was an exceptional 46.7%. Even more importantly, his offensive production didn’t diminish the defense and transition for which he earned his reputation. Abbott earned three 3rd place votes for the 2013 Warrior Defensive Player of the Year and two 3rd place votes for the 2013 Warrior MVP. In order for this to work, Thompson must beat Ricci to his spot. Ricci’s hips are squared to drive Thompson out and deny the left-handed shot from the wing that Thompson takes so often. Thompson keeps the stick in his right hand and intentionally draws Sweeney. Ricci (whose back has been to Sweeney this whole time) also stays with Thompson, leaving Crowley wide open. Jovi is the perfect example of an extraordinary athlete with an atypical skillset. He is a below-average shooting midfielder, but there are plenty more aspects to his game. As a dodger, he is more dangerous starting in the alley than at midfield. His ability to crease-dive makes him unique. Defenders would often like to push someone dodging from the alley to goal line extended in order to decrease their shooting angle. However, funnel Jovi to GLE and he will leap at the last second and score. Watch the respect Jovi demands from a non-traditional scoring area. Pause the video at 0:03. Look at where the defense is; three men are moving to Jovi. He makes the right decision by feeding X where the Hounds should be able to reset and find the open man. When he is not dodging, Jovi is very active on the crease. He is able to catch and finish in traffic with both hands better than most dodging midfielders. The second-overall pick in this year’s MLL Draft missed most of his senior season at Virginia with a lower extremity injury. LaPierre will apply for a medical hardship and should make his MLL debut next summer. His offensive numbers in college have declined every year (19 points in 2010, 13 points in 2011, 6 points in 2012). However, the New Jersey state record holder for touchdowns in a season (44) should make opponents pay with the new horn-less sideline restarts. Hawkins is the least polished offensive player on this list, but by far the most dominant defensive player. His style of play demonstrates one of the key points of this argument: It is less a disappearance of defensive midfielders than it is an overthrowing of offensive midfielders. I am not arguing that players like Hawkins will be left without a job; in fact, I am arguing quite the opposite. Would you rather have Kevin Martin or Tony Allen? Kevin Martin makes $11.52 million and is defensively disabled. Tony Allen makes $3.15 million but cannot make a jump shot. Give me Tony Allen. Why? I can live with one of my five players on the floor being a non-shooting threat. Basketball (and lacrosse) often boils down to a battle of glorified two-man games and court (field) spacing. Give me the defender for a quarter of the price. Now you’re saying: “Well you can have Hawkins – and sub him out on offense! Best of both worlds!” True – for now. Once MLL teams have to start making decisions based on salaries, things will change. Hawkins will demand top-notch money since he is one of the best at his position, right? If you pay Josh Hawkins more than a typical defensive midfielder, then you have to cut back on spending somewhere else. Sure, you could cut back on close defensemen or goalies or face-off men. But why not just cut back on offensive midfielders and try your luck with Hawkins on both sides of the field? Besides, your top midfield line in a 30-team league would be lucky to consist of Mike Stone, Josh Amidon and Kevin Cooper. …and he can finish with both hands on the crease. The former first-overall pick only appeared in six games for the Boston Cannons this year, but has proved his ability to play end-to-end since 2007. Heim has 84 career points in 64 games with the Chicago Machine and the Cannons. At 5’11’’, 205 lb. he is more than capable of defending some of the most physical midfielders in the league. Have a question or idea for Joe? E-mail him at joekeegan21@gmail.com! Include your first name and hometown. You could be featured in his next mailbag column! Last year showed signs of hope for Nevada-style offenses. Whether these will enjoy long-term success in the NFL is yet to be seen. My guess? No. VY won Rookie of the Year. He encored that with 9 touchdowns and 17 interceptions. Defenses will figure out how to contain Kaepernick. Injuries will get to RGIII. (Cam Newton’s attitude is so bad that I forgot to insult him here and am now inserting a footnote to the footnote.) The next decade belongs to Rodgers, Ryan, Luck and Flacco. This argument is strictly for Major League Lacrosse. Carrying defensive midfielders may prove to be a viable strategy at the collegiate level for the rest of time. Heck, full court presses and 2-3 zones still dominate NCAA basketball. Okay, maybe you could. But only because you’ve heard people make fun of how bad MJ’s draft picks turn out. When the ball goes out of play on the sideline, a coach can ask for a “horn.” This allows both teams to make substitutions before play is resumed. Now, a sideline out-of-bounds results in a quick restart. Since a sideline out-of-bounds (as opposed to an end line out-of-bounds) is typically associated with a change of possession, this denies teams the ability to swap personnel packages. This is not an endorsement for sharp-shooting players with the mobility of Mike Miller. There will never be room in the sport of lacrosse for Mike Millers. This is not a knock on Stone, Amidon or Cooper at all. Actually, I think they are all fantastic players. The point is that these players are not as well known as others, and that the days of the Hunt-Dixon-Brooks lines are limited. Enjoy ‘em while they last.